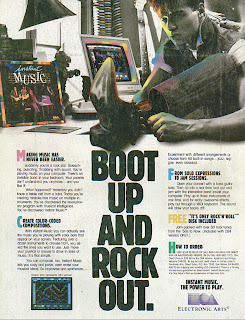 In the previous post, Michael Braisher introduced us for the first time to a software package written in 1986 by Electronic Arts called "Instant Music". I think it deserves a second look, and here is the original review. 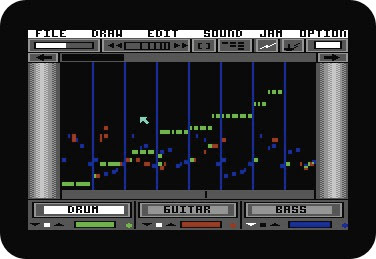 Published for the C64 and Amiga machines, Instant Music was a unique composition program. By use of either preset or created templates, complex symphonies could be made simply by plotting the notes and chords using the mouse pointer on the screen. As rules governing a piece’s construction ensured only the ‘right’ chords and structures could be created, the building blocks of the musical document comprised a mere series of collated coloured lumps. The sequencer required no musical knowledge to operate, though the ‘artificial intelligence’ could be disabled for use by the musically proficient. Thanks to its MIDI capabilities, use can be made with this software of not just the C64’s own SID chip but also of any MIDI instrument, including the Commodore Sound Expander synth’ plug-in. If there had been an Instant Music 2 we could have enjoyed a more stable program with perhaps greater control over the SID. Another nice feature could have been a printout facility to properly script the musical notation. (Still, MIDI output into PCs running suitable SID VSTi and notation software could do such a job). It is also a pity that no C64 emulator appears to exist which can interact with the MIDI socket(s) found on most soundcards. Well, watch my own little space as I hope to have the Amiga version up quite soon. And remember that the WinUAE Amiga emulator can interact with a soundcard's MIDI socket. Which means that you can have maximum fun with VSTi, etc. what cartridge to use to coonect midi? The Passport and Sonus cartridges are good. You can find them on Ebay. i love instant music. if you zoom, you have better control of the note pitches.